It’s a scenic trip to collect a few of the old group, starting out with a visit to Joe (Morgan Freeman) in a New Orleans retirement home and Marvin (John Malkovich) in the Florida Everglades. Then they collect Victoria (Helen Mirren) who’s running a B & B. Age hasn’t drained their skills of survival. 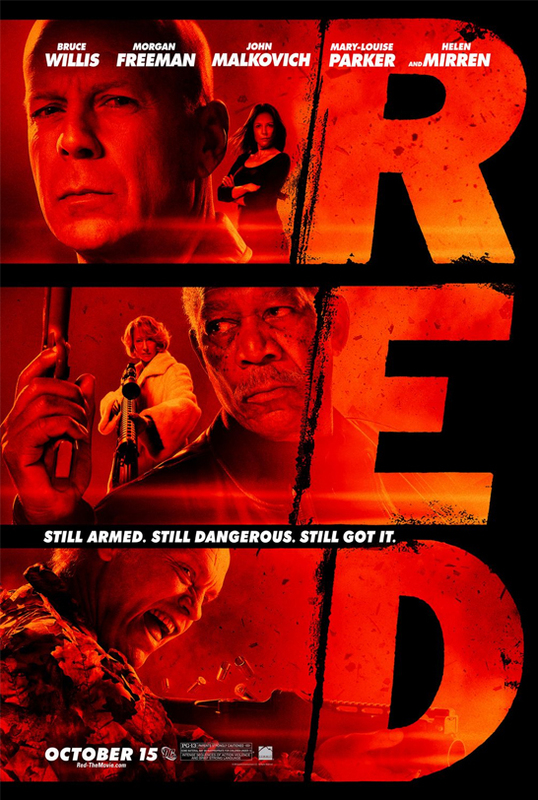 RED is a comic thriller, adapted from a darker graphic novel. Fans of the comics will find this film lighter and likable. Willis is still playing the sardonic, wisecracking, good-at-killing guy, but it works well. In fact, it’s the charismatic cast that keeps the ball rolling as well as the fact that they, and the movie in general, do not take themselves seriously. A surprisingly entertaining and humorous film.